For those who dream of bathing in chocolate, we offer a new addition to our HOT! Chocolate Collection of organic chocolatey goodness! 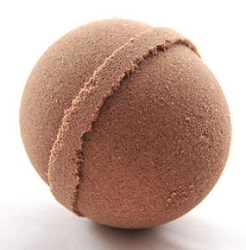 This fantastically fizzing bath bomb fills your tub with skin-softening Fair Trade Organic Cocoa Butter and antioxidant-rich Fair Trade Organic Cocoa, along with a hint of real vanilla and cinnamon for a scrumptious natural scent. Full Ingredients: Baking Soda, Citric Acid, Sea Salt, *Fair Trade Organic Cocoa, *Organic Cocoa Butter, *Organic Sweet Almond Oil, Pure Extract of Cocoa, Vanilla and Pure Essential Oil of Cassia, *Organic Cinnamon, Vitamin C. (*Certified Organic) 100% Natural. Gluten-Free. 7 oz. wt. Each of our Bath Bombs are a generous 2.5" in diameter, and come packaged in biodegradable clear cello bags with hand-tied recycled paper tag.